Bernard Madoff, the former Nasdaq chairman who was charged on Thursday with massive fraud, was long considered to be quirky. Employees at the offices of his eponymously named brokerage firm in midtown Manhattan's Lipstick Building had to follow strict rules for what they kept on their desk. Family photos were allowed but only if they were displayed in a simple black frame. Madoff was best known for being a pioneer in the business of market-making. His firm, which he started five decades ago with money he earned as a lifeguard in Far Rockaway, Queens, was for a long time primarily in the business of acting as a middle man between buyers and sellers of stocks. It is an essential function for a market like the Nasdaq, which doesn't have an actual trading floor where buyers and sellers can meet face-to-face. Madoff's firm was a major driver behind the growth of the Nasdaq, creating a system that courted brokers who had mostly traded stocks on the larger New York Stock Exchange to do more of their business with the Nasdaq. "He brought a lot of business to the Nasdaq," says Alan Davidson, a former Nasdaq board member and president of brokerage Zeus Securities. "He was a powerhouse on the NASD board. It's a real shock." While many other boutique brokerage firms sold out to larger firms, Madoff Securities stayed a family business. Madoff for years ran the firm with his brother Peter. More recently, much of the market-making division was headed by Madoff's two sons, Andrew and Mark. 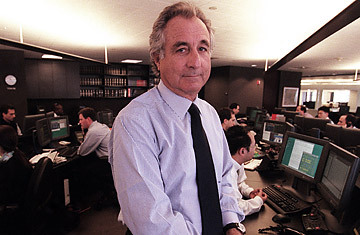 In the 1990s, Madoff used his success as a market maker to help launch an asset-management firm. Madoff raised money for his fund by exploiting his social network, often courting investors at country clubs where he or family members belonged. At the Palm Beach Country Club, Madoff reportedly found a major investor who helped attract other members for Madoff's fund. Another Madoff feeder fund was run by Maxam Capital. The head of that firm, Sandra Manzke, a former head of Tremont, has recently been outspoken about misbehavior in the hedge-fund industry. She recently sent a letter out to hundreds of hedge funds berating them for their large fees and for halting client redemptions when funds were down. "I am appalled and disgusted by the activities of a number of hedge-fund managers," she wrote in late November. Madoff was a donor to the Democratic Party and to Jewish organizations. A number of large Jewish charities are expected to be among the investors who lost money in Madoff's funds. Madoff was chairman of the board of Yeshiva University's Sy Syms School of Business and treasurer for the university's board of trustees. A representative for Yeshiva said the university was still trying to find out if the institution had invested money with Madoff. Also among Madoff's investors was Fred Wilpon, owner of the New York Mets, whose investment firm reportedly had as much as $300 million with Madoff. "We are shocked at this revelation," said the university representative. "Bernard Madoff has tendered his resignation from all positions and involvement with the university. Our lawyers and accountants are investigating all aspects of his relationship to Yeshiva University." On the surface, Madoff's funds were supposed to be low-risk investments. His largest fund reported steady returns, usually gaining a percentage point or two a month. The funds' stated strategy was to buy large cap stocks and supplement those investments with related stock-option strategies. The combined investments were supposed to generate stable returns and also cap losses. But sometime in 2005, according to the SEC suit, Madoff's investment-advisory business morphed into a Ponzi scheme, taking new money from investors to pay off existing clients who wanted to cash out. According to a form filed with the SEC, Madoff reported that the business had $17.1 billion under management in January 2008. As the market got worse this year, Madoff continued to report to investors that his funds were up  as much as 5.6% through the end of November. That would have been a remarkable performance. During the same time, the stocks of the Standard & Poor's 500, where Madoff supposedly did most of his trading, had dropped a weighted average of 37.7%. Despite his gains, a growing number of investors began asking Madoff for their money back. In the first week of December, according to the SEC suit, Madoff told a senior executive that there had been requests from clients for $7 billion in redemptions. On Wednesday, Madoff met with his two sons to tell them the advisory business was a fraud  "a giant Ponzi scheme," he reportedly told them  and was nearly bankrupt. The sons reportedly contacted their lawyer, who then alerted federal authorities to the fraud. Before being caught, Madoff was working on a scheme to dole out his funds' remaining $300 million to the firm's employees and his family members. Many who know Madoff say they are surprised by the revelations. "Many of the assets he took were from friends and family," says a former Tremont official. "It is almost inexplicable. Even the people I have talked to who have had long relationships with him are shell-shocked."